While Google has continued to toss new features into the camera app shipped on its Nexus devices, many Android phones replace it with something else. But just as we revealed a few weeks ago, now it's available in the Play Store, ready to run on any phone or tablet using Android 4.4 KitKat. Beyond bits like Photo Sphere that we've seen before, Google is filling in the blanks on its new "Lens Blur" option. Meant to emphasize the subject while blurring the background for an impressive depth of field effect, it uses algorithms to simulate the large camera lens and aperture your phone or tablet doesn't actually have. Taking the photo requires an upward sweep to capture multiple images, used to estimate the depth of objects for a 3D map that lets the software re-render the photo later and blur specific items based on where it thinks they are. 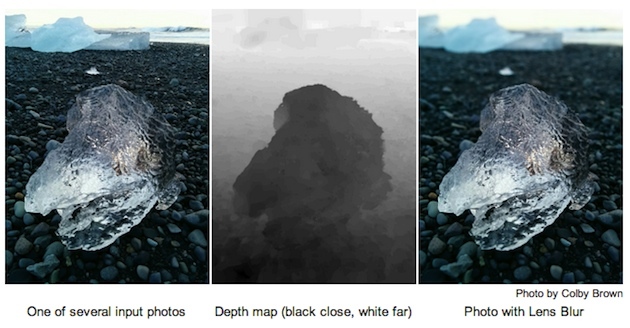 Google's Research Blog has more details on how it's all done, including the Lytro-like ability to change which object is in focus after you take the shot. Tired of tilt-shift effects after years of Instagramming, no matter how much math is at work? There's more to the new camera app than that; it has all the other features we'd heard about, like a "100% viewfinder" that makes sure you can see everything that will be in the picture on your screen before the shot is taken with no "dropped pixels" and a larger capture button. Panorama shots are better now too, with higher resolution, and Google's 360-degree Photo Spheres can be captured at up to 50 megapixels. Of course, the other element is that Google can extend its camera setup onto Android phones and tablets by other manufactures like LG, HTC and Samsung. So far their skinned retail devices have often skipped Google's enhancements for custom camera apps of their own, but like many other Android features over the years (Gmail, Calendar, Keyboard) making it an app in the marketplace should bring its features to more devices, and allow for frequent updates. If you don't yet have Android 4.4 KitKat, there's still hope, as the team says this app will come to more devices over the coming months. We gave it a quick try, and while not all of the features are available on every device (no Photo Sphere option on our Moto G, for example) it worked pretty well. Taking a Lens Blur photo is similar to a panorama -- except for swiping the camera vertically, and we were able to go back and edit the resulting image quickly. One cool, but unmentioned addition to the app is a reminder for video recording that tells you to put the phone in landscape instead of holding it in portrait. Surely, you already knew to do that, but hopefully it makes the next WorldStarHipHop brawl easier to watch in widescreen.